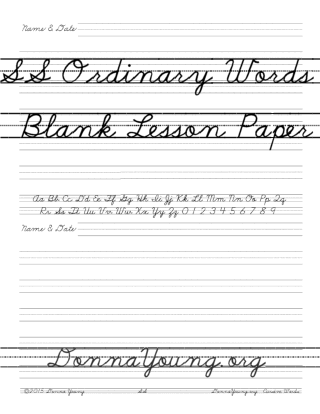 Each printable worksheets on this page contains two handwriting lessons. Each lesson will have seven ruled lines for practice. At the beginning of each line is a word and, on a few of the lessons, the word is listed twice. The word is written in a hollow font that the student should trace. After that, the student should write the word as many times as possible on the line and as neatly as possible. Each file is available in both color and gray scale. Life members have access to two special files which contains all of the lessons in either gray scale or color. 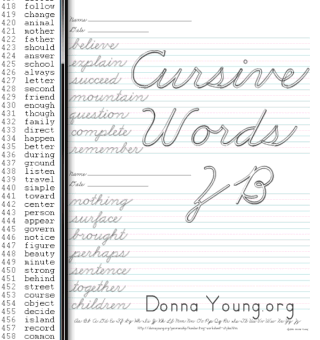 This set of printable cursive word practice contains slightly advanced words. If your student does not know the meaning of the words or how to use the words, I suggest that the student can look up the words in a dictionary or a thesaurus. If you want to add more to the lesson, well, that is up to you. I am providing the list of words that are in the lessons.